At Le Moyne, we look at success a little differently. It’s not just an outcome; it’s a way of living. It’s not just what you do, but why and for whom. Success means being slightly restless—fulfilled and challenged, absolutely, but always asking, “What else?” It’s setting goals again and again and again. 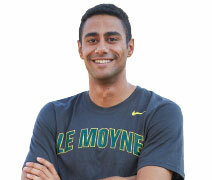 At Le Moyne, success means embracing the unknown, trusting in yourself, and never settling. It’s the tireless, constant pursuit of the best possible version of you. * Students may pursue a concentration in Education leading them to a New York State teacher certification. ** Students majoring in Biology, Chemistry, Computer Science, Environmental Science Systems, or Physics may also pursue a master’s degree in Engineering from the College of Engineering and Computer Science at Syracuse University. The College has partnerships and agreements with numerous graduate schools and programs, including Syracuse University, SUNY Upstate Medical University, New York College of Podiatric Medicine, SUNY Buffalo School of Dentistry, Cornell University, and numerous Law programs, including Albany Law School, Syracuse University College of Law, Suffolk University Law School, and University at Buffalo School of Law. Virtually unlimited study abroad options are available through a network of 180+ Jesuit colleges around the globe. Opportunities include Australia, China, the Dominican Republic, England, France, Germany, India, Ireland, Japan, Scotland, and Spain. of recent graduates report being employed or in graduate school within a year of commencement. 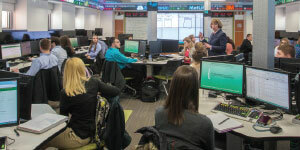 of students receive some form of financial assistance. of full-time first-year students live on campus. As a student at Le Moyne, you’ll benefit from small classes and a supportive, close-knit campus community. You’ll be well recognized not just for who you are but for who you have the potential to become. Your faculty members, leaders and innovators in their fields, will encourage you to ask questions, think deeply, and look beyond the apparent. In keeping with the College’s Jesuit heritage, you’ll balance academic and ethical insight, and in the process, you’ll build the foundation for a rewarding life that engages your mind, body, and spirit. You’ll discover being a Le Moyne student means having options, including more than 80 student clubs and a variety of academic, cultural, professional, and social service organizations to join. You’ll learn that much of what makes the College great, makes it home, takes place away from the lecture hall or lab; it takes place in the community and around the world. You’ll have the opportunity to conduct original research alongside faculty members, study abroad, gain hands-on professional experience as an intern, and be guided by caring mentors. Founded in 1946 by the Society of Jesus, Le Moyne College is a comprehensive institution offering students an outstanding foundation in the liberal arts and sciences along with careful preparation for specific careers. The College cultivates a lifelong passion for inquiry within each of its students through a course of study that is rigorous and centered on the development of the whole person—mind, body, and spirit. Above all, a Le Moyne education emphasizes leadership, service, and a commitment to social justice.